What Causes Gallstones? How to Dissolve Them? Almost anything can cause gallstones. The things you least suspect to cause gallstones actually cause gallstones. Fortunately, some treatments can remove those gallstones. The old treatments for gallstones were always surgeries, surgeries that can have severe side effects while not completely stopping gallstones from recurring. Modern people have come up with better treatments that will be helpful for different types of patients. Patients who need to work right after removing their gallstones, patients who do not want surgery, and even patients who don't have enough money can now take the new treatments to heal. Here are the top causes of gallstones, the safest treatments for dissolving them, and who can take certain treatments. There are many causes of gallstones. Increasing age can cause gallstones because of increased cholesterol in the bile. Gender can cause gallstones because women are more likely to get gallstones than men. Genetics cause gallstones because the families of American Indians get way more gallstones than the families of Africans. 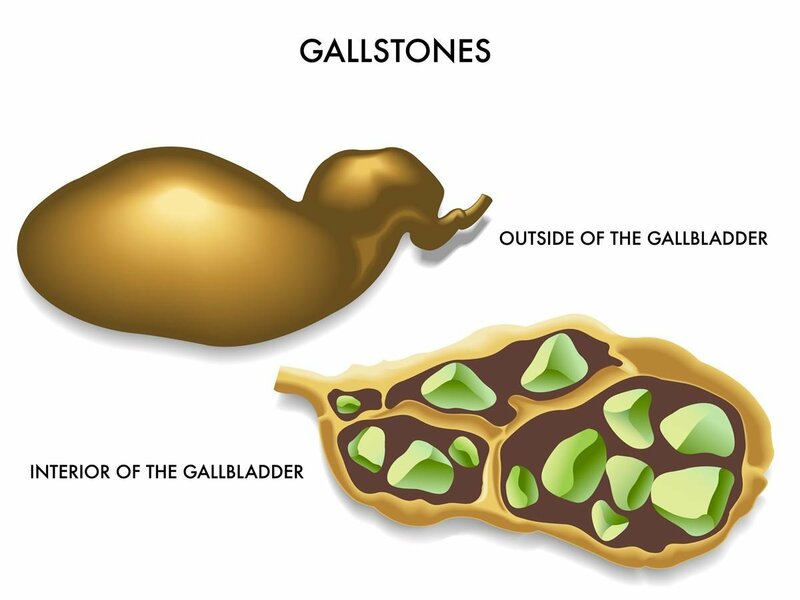 Obesity causes gallstones because of the high amounts of cholesterol. On the other hand, rapid weight loss causes gallstones because the liver produces more cholesterol when weight loss is too fast. A Western diet causes gallstones because of the fats and milk. Drugs cause gallstones because all drugs increase cholesterol in the bile. Oral bile salts can be used to get rid of gallstones. Chenodiol and ursodiol are types of oral bile salts that can remove gallstones. Chenodiol causes diarrhea and ursodiol do not cause diarrhea. Your gallstones will recur when you stop taking any of these oral bile salts. Only a few patients can take oral bile salts. Patients with symptomatic cholesterol gallstones can take oral bile salts. Patients with cystic duct and noncalcified cholesterol gallstones can also take oral bile salts. Patients who have acute cholecystitis or stones in the bile duct need immediate treatment and must not take oral bile salts. A mixture of plant terpenes can be used to dissolve gallstones, particularly radiolucent gallstones. They are more effective when used with bile acid. Patients who do not want to have surgery take these plant terpenes. Patients who cannot afford surgery take this kind of treatment. Plant terpenes can also be useful for patients who have health problems that disqualify them from the other forms of gallstone treatments. Check with your doctor first before taking this treatment, because you never know if the mixture is bad for your type of physical composition. Contact dissolution therapy is done by placing a catheter through the liver and inserting solvents like methyl tert-butyl ether into the catheter and the gallbladder. It can also be done by using a nasobiliary catheter that is placed into the gallbladder. The solvent can be passed through the nasobiliary catheter. It is a tricky treatment and must be done only by experienced doctors in real hospitals. This treatment can have severe side effects, one of them is burning-pain. It is not the best and safest treatment for gallstones. Try the safer treatments first before choosing to take this one. Prophylactic cholecystectomy is a treatment that is often recommended for certain patients, particularly children. The same treatment can be done for patients with other problems that are not gallstones. There are two types of prophylactic cholecystectomy: open cholecystectomy and laparoscopic cholecystectomy. Laparoscopic cholecystectomy is newer than open cholecystectomy and is known to require a shorter hospital stay after the surgery than the open cholecystectomy. Laparoscopic cholecystectomy is also more common than open cholecystectomy. However, laparoscopic cholecystectomy takes a longer time to be done than open cholecystectomy. Patients who have had way too many abdominal surgeries are not allowed to have laparoscopic cholecystectomy. Gallstones are caused by a wide variety of things like aging, genetics, drugs, weight, weight loss, and diet. Gallstones can be removed through surgeries, both invasive surgeries, and surgeries made possible by advanced technology. They can also be removed through the insertion of liquids into the gallbladder to crush them into smaller pieces and flush them away. The top treatments for the removal of gallstones are the treatments that are taken orally and do not involve surgeries, too many chemicals, and sever side effects.